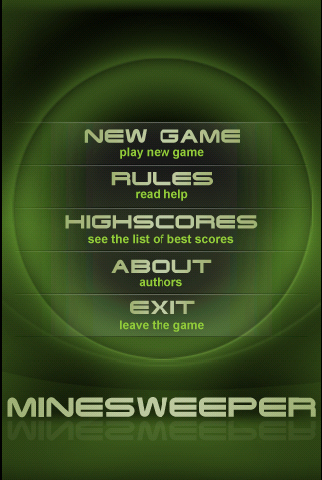 Minesweeper is a mobile version of one of the most popular single-player logical games ever made. The basic gameplay style became a popular but minor part of the puzzle game genre during the 1980s, with such titles as Mined-Out and Yomp. Cube was further succeeded by Relentless Logic, by Conway, Hong, and Smith, which was available for MS-DOS as early as 1985. The game is still very popular among players of different age and social origin. The proof is the fact that it is still included in the latest version of Microsoft Windows. The idea of the game is very simple - to find and label a fixed number of mines which have been randomly distributed across a grid. When the game is started, the player is presented with a grid of blank squares. When a grid square is clicked on (using finger), it reveals the number of mines in adjacent squares (unless it's a mine, in which case it's game over). 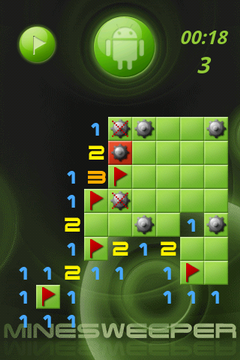 By using logic, players can in many ways use this information to find the squares without mines (or mine-filled), and proceed to click on additional squares to clear them or mark them with flag to indicate the presence of a mine. The game is over when abstract minefield is cleared from all mines, or in case the player clicks on the square with mine. There are 3 predefined difficulty levels (beginner, intermediate, expert), which define how much mines player must find to win the game. In the application also exists custom level which is reserved for fans. In custom mode you can specify size of the field and quantity of the mines for own fun. The player can place a flag graphic on any square believed to contain a mine. Special switch-button is used for switching to "Flag mode" (enables player to place flag). Press this button to enter or exit this mode. Squares marked with a flag can be cleared or added only in "Flag mode". Although it's a simple game, there are plenty of ways of increasing your odds of winning or shaving a fraction of a second off your high score. There are numerous strategy guides available. 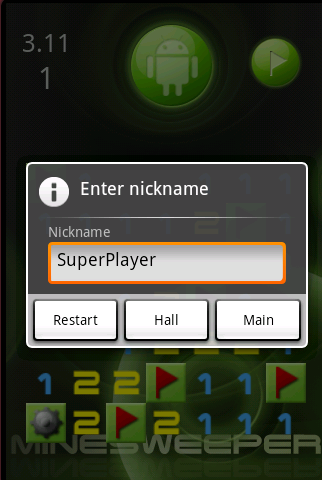 Player can use android logo button to restart the game from the beginning. Tap on the number opens all around squares, if the number has exact number of marked mines (2 for "2", 5 for "5", etc.). If there are too many or not enough flags, nothing will happen. Use it carefully otherwise it will boom. 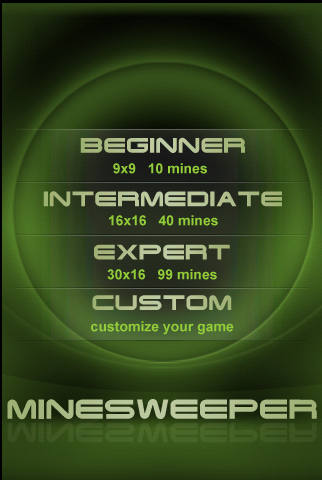 From now you can perfect your skills of mine sweeping, playing our Minesweeper on your phone.